The sun is shining bright in the afternoon sky and few fluffy clouds lazily float through the air. A bright checkered blanket is spread out under a tree that sits atop a grassy knoll. A small basket filled with goodies sits in the middle of the blanket, with a sandwiches and a couple of sodas inside. The smell of sunflowers fills the air and you can hear the birds chirping their delightful tune. It almost seems like the perfect summer day, doesn’t it? There’s just one thing missing from this picture—a giant slice of juicy watermelon! Summer doesn’t officially start until you take a bite into that first chunk of melon! If you want to give your child a look that embodies the very spirit of summer, then what better outfit than a watermelon costume? 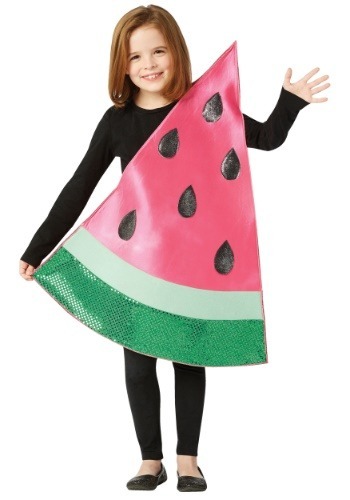 Well, it just so happens that we have a costume for just about any occasion and this particular watermelon slice costume for kids will have your little one feeling like a summer afternoon. This Watermelon slice kid’s costume is not only adorable, but it also makes you a hungry for a juicy piece of fruit. The main piece of the costume is designed to recreate the look of a freshly cut slice of melon, complete with the pink sides, the black seeds and the green rind. The rind even has a sparkly look to it, so your child will be one glamorous little melon! You can pair this sumptuous summer style with the rest of our fruit costumes to be a whole group of picnic treats, or she can head to her costume party solo as the treat that everyone loves to eat! Be sure to check out our many adult food costumes to help get the perfect parent and child duo costume this year.